Hey, I might see you at Quilt Canada's NJS in Halifax this week. I'll be there today and tomorrow visiting the shows and markets. I can tell you that I'll be overloaded with inspiration and ideas. I may even have to take sleeping pills for a few nights. If I don't, I sew and think all night about projects. Do you get like that when you go to big quilt shows? If you need more information on the shows, click here. And I'll see you there!! My daughter was here on the weekend and showed me a cute reusable snack bag that she bought. It was the perfect size to hold a sandwich. I have seen a number of tutorials for these so, while at Fabricville yesterday, I bought some nylon fabric, Velcro and cute patches. Here is my prototype. It's cute. I'll definitely make more for the kids to use. Nylon envelope for a sandwich. Nylon is washable, but not that breathable so it will hold freshness for hours. Fits two slices of smart bread nicely. Got a set of 9 little patches to sew on the sandwich bags from Fabricville. They are all sweet. I'll use them all. I was mentioning this while hand-quilting at the church yesterday, and my friend Doris K. said that ever since she started using this Cloud Nine recipe (from the Leo Hays High School cookbook), she's been pleased with her biscuit results. She said they are like her mother used to make. Well, I couldn't wait to try them. I made them this morning. They came out fabulous. They rose nice and high and they were great with a bit of jam. My friend Lucy came for a coffee this morning, and she tried them out... She agreed... they're delicious. Sift dry ingredients. Cut the butter or marg into the flower with a fork or pastry cutter. Combine egg and milk, then add to flour mix. Stir gently into a ball and turn on to a floured board. Kneed 20 strokes. Pat to 3/4" and cut out using a cookie or biscuit cutter. While not necessary, I place my biscuits close together so they are touching. Bake on an ungreased pan at 450 degrees for 10-15 minutes. Before baking, you can chill them in the fridge for up to 3 hours before baking. Perle Cotton - Do I have enough? The fly stitching on my Winter Wonderland is coming along nicely. It probably is taking me a longer time that it would you, but I don't mind. I'm doing it while watching all the season finales of the Idol and Dancing shows. I like how my four meeting corners came out. I didn't realize that there was four corners meeting....If I had of looked ahead, I would have spent time pre-planning for it.. I probably would have a worried a bit about it... Hmm, funny how some things just turn out good. There's just one little thing I'm starting to worry about. Will I have enough perle cotton to complete the stitching. I have two long horizontal seams to stitch over. I think each line will take about 4 or 5 needles.... What do you think... Enough? In another few weeks, and we'll be seeing local strawberries at the market. Oh my mouth is watering already. This means it's a great time to make jam out of the last of last year's berries that we froze. I've been using the same recipe out of the Certo package for years. 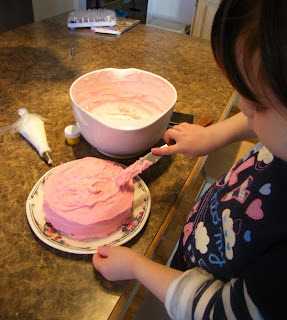 It's a easy no-fail recipe and very popular in our house. And since we're expecting company next weekend, we plan to make a strawberry-rhubarb pie out of another package of the frozen berries. What will you make with your frozen berries from last year? We had a great holiday weekend. We've been waiting all spring for these warm days. In addition to a fun visit with my sister, nice and baby Jack this morning, we had Caitlin and Aurora visit us this afternoon. Aurora doesn't get in the house for 10 seconds now, and asks "Wanna make cookies Grammie?" So guess what we did.. Caitlin did most of the work, while Aurora sampled the cookie dough. Oh, she's going to have a belly ache! I processed another batch of beach glass this week. Two bottles from my friend Pat. One bottle was very dark. I thought it was blue. Now that it`s broken, and frosted, I think it`s green..... It`s beautiful just the same. And the other bottle was light blue fading to dark blue at the neck of the bottle. I love how I have many shades of blue glass from that one bottle. I love the look of the colored glass with pearls and crystals. I can`t wait for Grammie camp this summer to do our jewelry crafts. Making quilt kits for Charity - This is a good idea. I went to our final guild meeting of the year the other night. It was a pot luck and you can imagine the delicious supper we had. Because of snowbirding and other travel, it's been a few months since being there. I've been a little low on the sewing mojo lately. But one of the things that our "Community Projects Team" did, was to make up quilt kits for members to take home. It's like our summer homework. These kits had everything in them... the fabrics were cut, the pattern was simple. We even got to take a batt and backing. So because I was early, I got my choice of over 20 kits. They were all very nice, and I chose one that would be good for a teen girl. It's Monday. I'm working on stitching the blocks together on my Winter Wonderland quilt. I started this last July, never dreaming it would take me this long. So, I decided it's time. I need to keep working at this, even if it's a little bit, so it will get done. I guess, I'd like to have it done by this July. The center hand-stitched blocks are sewn together, and now I'll be hand-stitching over the seams to define the blocks. I plan to do this hand work in the evenings, I'm sure it's going to take a week or more. We had an awful nice day today. My daughter ran a 10k run today. We were all up early to go out and cheer her on. 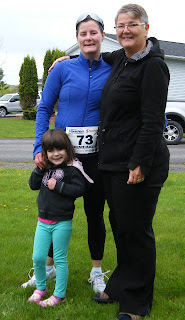 The day started out bright but cool... about 2 degrees C and then became overcast with light sprinkles.. Poor Patience's hands were so cold when she crossed the finish line. Little Aurora was so proud of her mommy (and I was too). Aurora was waving and clapping and cheering with her arms n the air, as Patience crossed the finished line. 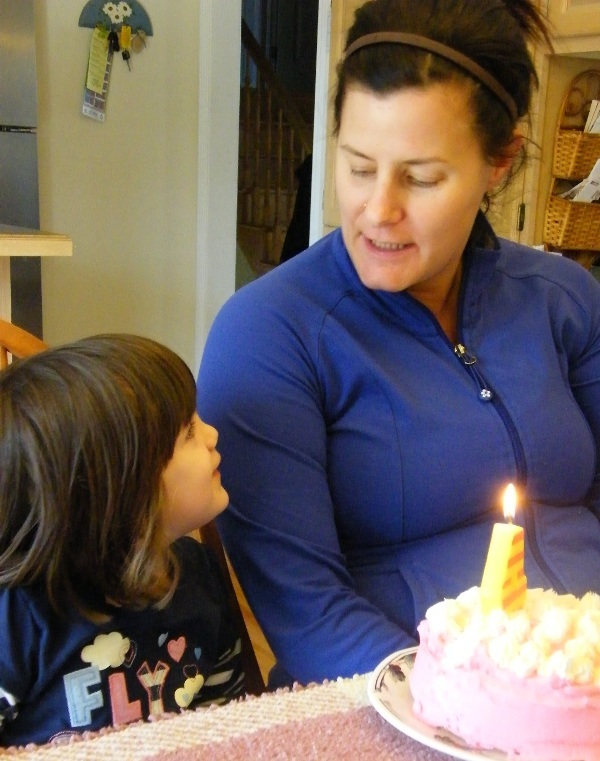 A fun Mother's Day for us all. Great run P.
While at the beach this winter, we spent countless hours on the beach. In all that time, we never came across one piece of beach glass. For some time now, I've been thinking of making simple sea glass jewelry projects with the kids... So before the kids grow up on me, I've decided to make my own sea glass. I purchased a small rock tumbler from Harbour Freight while snowbirding in the states. Now that our travelling is done, for a few months anyway, it's time to make sea glass. For my first batch, and very carefully, I smashed a very light green bottle and a clear bottle to do my sea glass experiment with. Harbour Freight 3 lb rock tumbler. Fill tumbler half full of broken glass. Be Careful! Sharp! Then add 1/2 cup of beach sand, and fill with water to almost cover glass. Add a couple of marble sized rocks. Put the cover on the tumbler tightly, and tumble for 2 days. Here is my first batch. 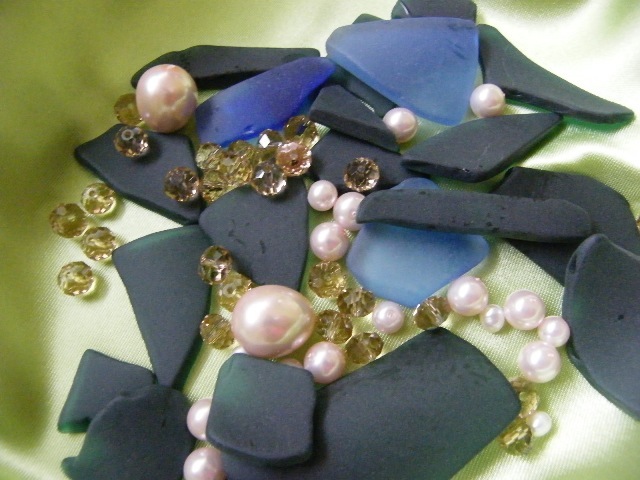 It'll be fun to make some Sea Glass jewelery with the kids this summer. Maybe at Grammie Camp. Isn't it beautiful, and look how nice it'll be when put with a silver chain and maybe a pearl or two. Oh, I'm hooked now. I can't wait to find some colored glass. I have my next batch on already. Brown glass and thicker light green glass. I can't wait to see it. My friend has a blue wine bottle for me. I'm so anxious to get it for my third batch. I'll be searching this week for a red or purple, or another color bottle to put with it. I was most impressed with what I saw at the demonstration silk factory. 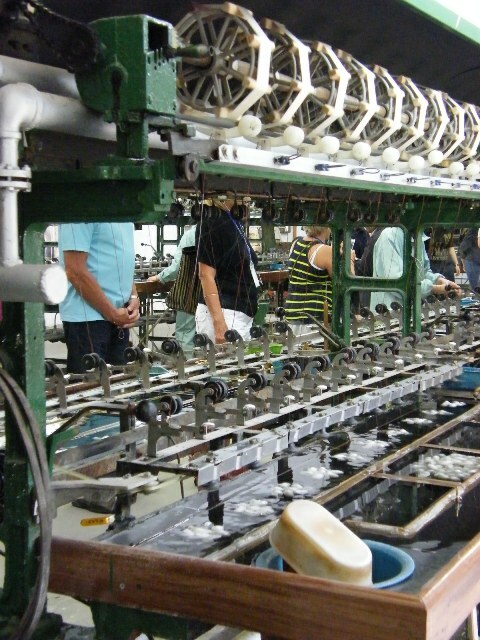 It's not a real factory, it's set up to show visitors what the process is to make silk. It was a visit that was near the end of our China trip. I was a little overwhelmed with all the history of China.... the Ming Dynasty, the Qing Dynasty, so many Bogotas and Chinese gardens etc. This factory tour came just at the right time. Making fabric.... it was almost like comfort food to me. Burn a small piece, and if it melts into a tiny ball, it's poly. If it turns to ash, it's silk. Or, with a bit of practice, with a light breath, you can lightly blow through any silk and feel the breath on the back of your hand. Your breath will not pass through polyester fabric. Cocoons are graded and the single and doubles are separated. Eight single cocoons are submerged in the steaming water and threaded into the guides. 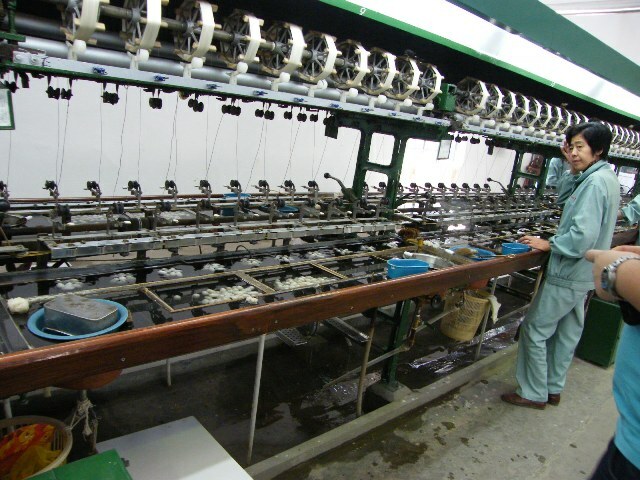 From the eight cocoons, the eight micro silk threads are pulled up and twisted together to make a single thread which is wound on a hank at the top of the photo. 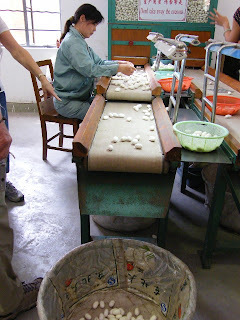 A while row of spinning cocoons are taken care of by a single worker. We learned about the single cocoons and the double cocoons, which I had never heard of. They are very valuable. Double cocoons are when two worms start spinning their silk too close to each other and it creates a bigger, but matted cocoon. These double cocoons are layered in groups of 100 cocoons, then by hand, they are stretched on top of one another to make a duvet type of quilt. I bought a queen sized duvet quilt at this factory for just over $100 and it had 10,000 cocoons. I was floored by the number of worms that it took. Here's a short video of how they stretch out the pad of 100 cocoons. It takes 100 of these to make one duvet. This factory did have lots of clothing and silk scarves and ties for sale, but they were rather pricey. I was hoping they would have the thread by the spool and even some yardage to buy, but there was none. I'm glad with the purchase of my duvet. I'm taking an online photgraphy composition class. Our assignment was to take 5 photos in a 10 x 10 foot space. Well for me, it was in my sewing room. I could have taken 100 pictures. My most recent little sewing project. A little gift bag. Free Pattern from Sew Mama Sew. I like it. My workspace. Looks a little messy, but that 12" x 12" space on the table is calling me! Can you ever have too many scissors. These are a fraction of my collection. A sewers bookshelf. Not a book in sight. Buttons in a recycled tin can. Reminds me of my techy days gone by and my fun filled crafty days now. This past weekend, Aurora and I had something very important to do. 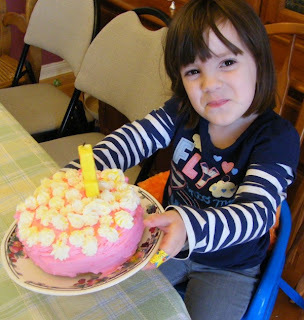 We made a birthday cake for her mama big birthday BBQ. Aurora has made lots of cakes in her day, so she knows exactly what to do. 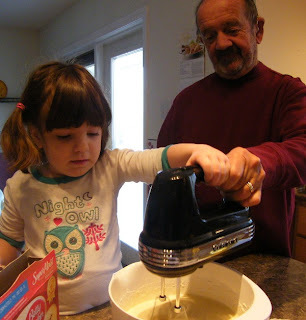 First you put eggs water and oil in the cake mix and ask Grampie to help you mix. 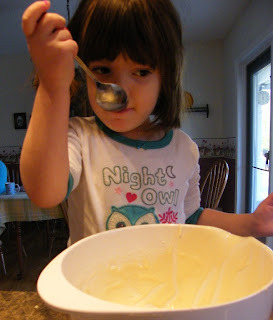 While the cake is baking, we lick the bowl. Then the fun part. Ice the cake in a pretty color. 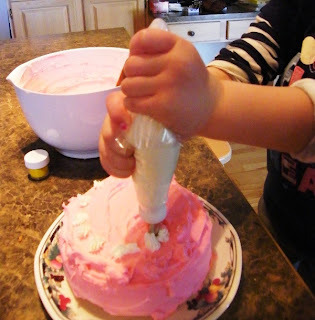 Then pipe little flowers all over the top of the cake. 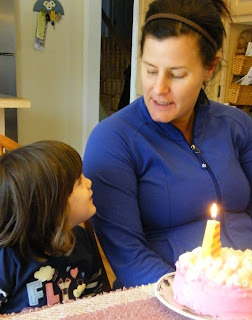 Add a candle, and voila.. A special birthday cake for mom. 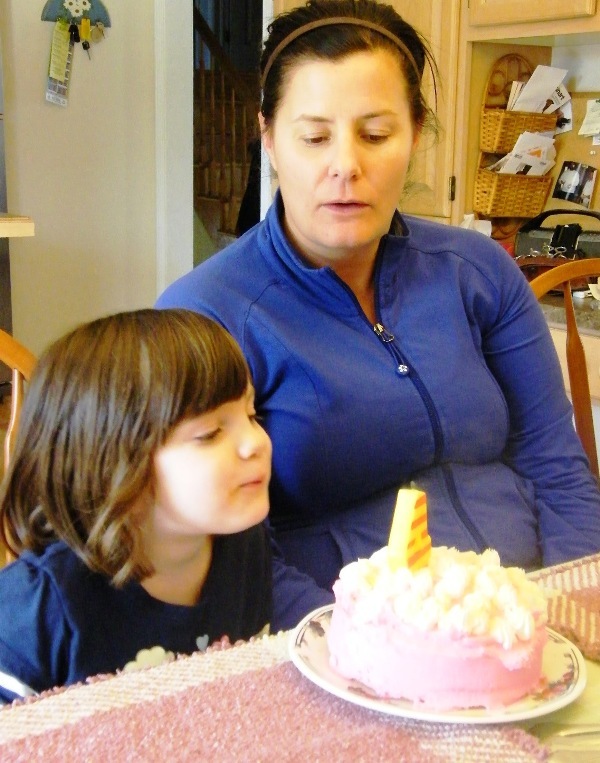 Aurora helps her mom blow out the candle.